When you say "sideboard" at Linderhof, it means one of three -- for there is one in the living room and one in the breakfast room besides the one in the dining room. 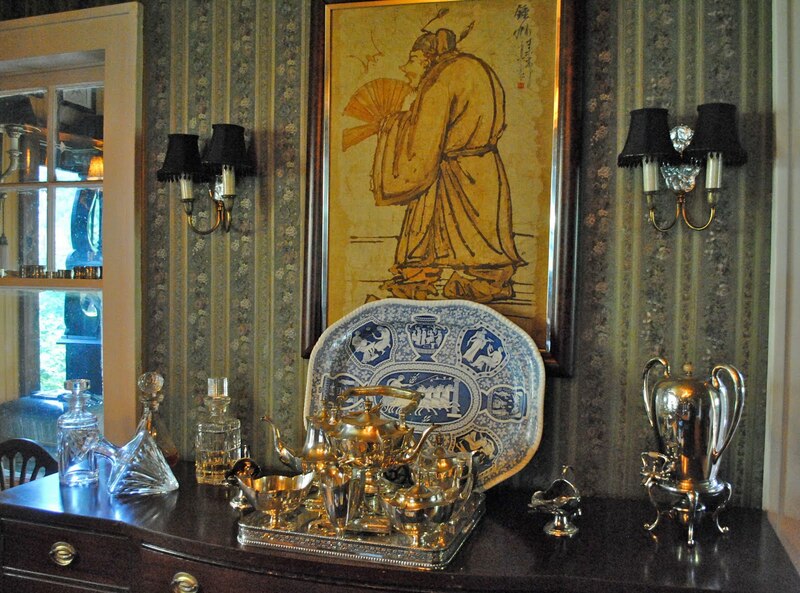 But I still think of the dining room one as The Sideboard -- it was, after all, the first! It's one of those 30's/40's reproduction of Duncan Phyfe/Hepplewhite sideboards made from mahogany that are so common. You can find so many of them that I think that perhaps every household in American had a variation in their dining room! We bought it when we moved here 22 years ago along with the table and the chairs that are now in the breakfast room. It has served us well. It has always hung in our home and mostly in the dining room and mostly over a sideboard. On the top (right now, anyway) are some favorite items -- my silver coffee urn. I had sold an article to Midwest Living and with the money I bought this -- an always wanted item. It was the exact same price as my Midwest Living money. And I've always treated my "extra" money as just that -- to buy things that I could not afford in our regular budget. I've had this for a long time, actually, and I still love it as much as the day I found it in the antique shop. 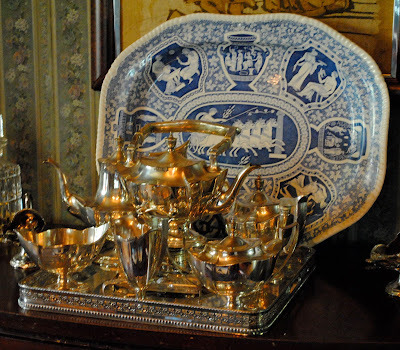 The silver coffee/tea service is always on the sideboard -- no matter what I do with each end! I love English gallery trays and this tray was an Estate Sale find and corrals the set nicely. Behind, is a huge Spode Blue Room platter. Found at an outlet mall for $100.00. I walked in the store, saw the platter and the price and immediately grabbed it. It was marked down -- way down and I felt so lucky. I have been haunting that store ever since, hoping against hope that the Spode Italian tureen would be similarly marked down. Alas, it never has. But I do have this wonderful platter which I treasure! 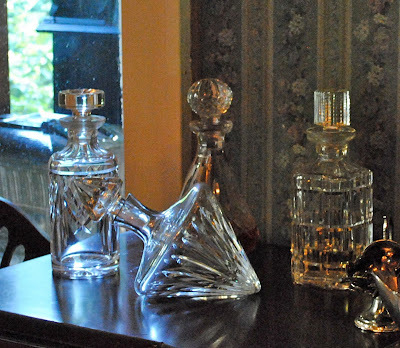 Currently, the Waterford decanters are on the other end of the sideboard. Purchased one at a time -- and all at great prices. Each is a different pattern but I don't care -- I don't like everything to be matchy, matchy! I was so excited to find the first one and felt that my life was complete for I had a Waterford decanter! But, then, over a 10 year period, I found three more and all at really great prices! Steals, really. They're all different patterns but I like that. For dinner parties, we will fill them with liqueurs. Poured from a Waterford decanter into wee Waterford glasses, it makes any liqueur elegant! It's Tuesday and I'm joining Marty at A Stroll Thru Life for Tabletop Tuesday. I guess, however, mine should be Sideboard Top! Please join Marty and see what other tabletops there are this Tuesday! Hi Martha! I just love coming into your home and seeing your treasures! Your silver pieces are so beautiful. Your coffee server is gorgeous! The blue and white platter is lovely with it too. I think I recognize your sideboard somewhat. We had a similar one when we lived on an Air Force base in Maine. It was government issue. It might not have been the quality of yours but I loved it and wish I could have bought it. 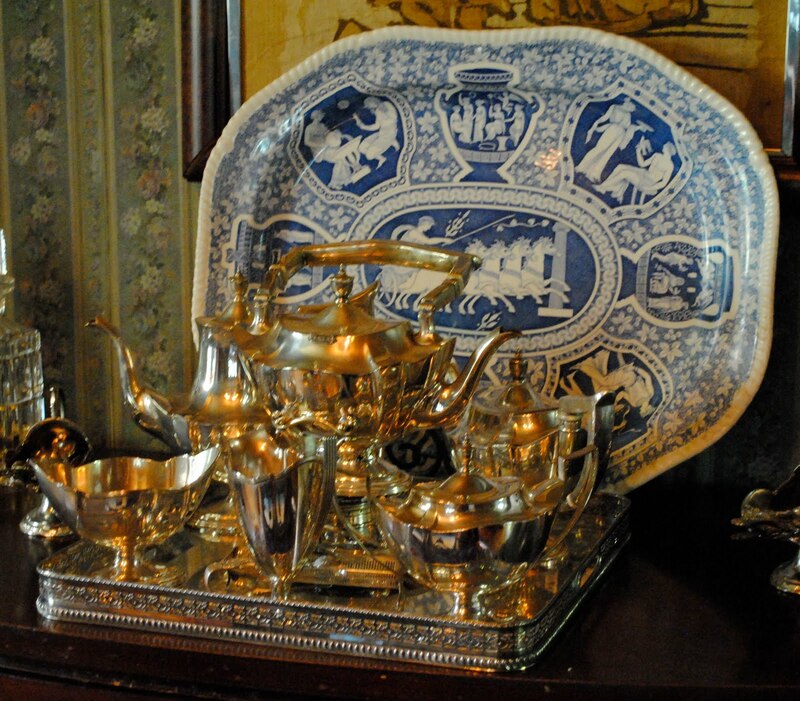 I stored my silver and linens and probably my china in it. That was almost 40 years ago! Love the Waterford decanters. Oh no.. matching might be boring. Oh, so pretty! Elegant, traditional -- perfect. That platter is amazing! Good call on that one! We have more than one sideboard, too, so I have designated them by different names! Love yours -- is it up on long legs, or down to the ground? I love both styles. I think it's just right that the decanters don't match - they'd not be half as interesting. Your sideboard is a comforting sight. My mother, grandmother and several aunts had similar ones. My grandmother's always seemed to be laden with food and, when not a mealtime, simply covered over with a white damask table cloth. Delicious memories! It's a ship's decanter -- it rolls so that when the ship goes up and over waves it doesn't fall over -- it just rolls around! I assume, however, that it is somewhere that it doesn't roll off! My, I'm always uplifted when I visit your posts. 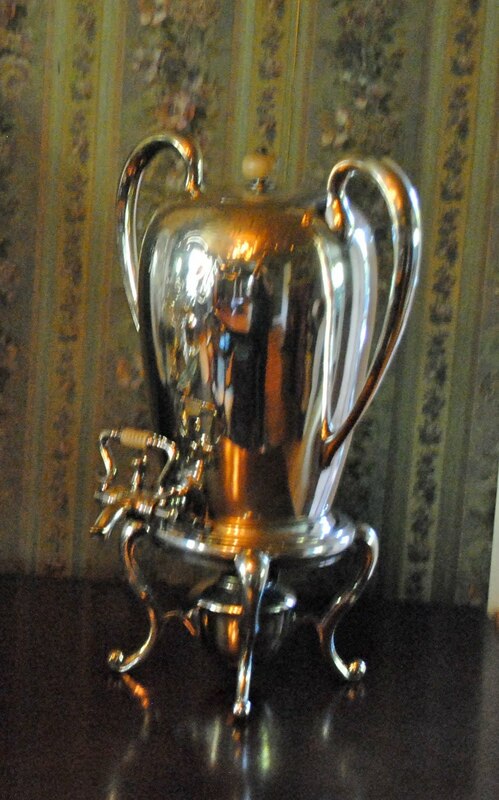 Just love your furnishings, silver, crystal and style. Also enjoy the commentary you provide. When I just want to enjoy life as a curious browser I go to Lines from Linderhof! I'm never disappointed.